General Awareness Topic: How Repo Rate checks inflation? 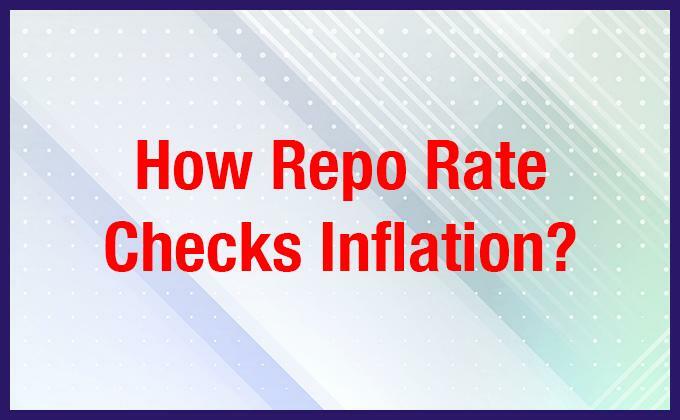 How Repo Rate checks inflation? MBA Aspirants are expected to know on what is new in economy and what is that impacting it? Today, you will read on How Repo Rate checks inflation? Before going into the details about how repo rate affects inflation and vice versa, it is important to understand what repo rate is? Repo rate is the rate at which the Reserve Bank of India (RBI) lends money to commercial banks. Repo rate is also an instrument of monetary policy. When commercial banks run out of funds, they turn to RBI for help. So, when the repo rate is low, banks get funds from the RBI at a cheaper rate. Recently, the governor of RBI, Raghuram Rajan, unexpectedly raised the repo rate by 0.25 percent, from 7.25 percent to 7.5 percent. In simple terms, the cost of borrowing has increased for commercial banks. The impact of repo rate on inflation and the rest of the economy is known as the transmission mechanism. The public expects RBI to do what is necessary to reduce the rate of inflation. Currently, India is experiencing a high inflation rate. So, with an increase in the repo rate, the market interest rates will rise too. This will lead to a decrease in consumption and investments, and ultimately a reduction in the demand. This will eventually lead to a decrease in the rate of inflation. This is exactly what Raghuram Rajan is aiming at. Repo rate also has an impact on the exchange rate. When repo rate is increased, like what has happened in India, the market interest rates also increase and lead to a stronger exchange rate. This leads to an increase in imports and decrease in exports. With lower import prices, inflation rate is once again lowered. As of August 2013, India’s inflation rate was recorded at 6.1 percent, the highest in the last 6 months. The rate of inflation has been increasing uncontrollably in the last few months, which is why RBI has been forced to take extreme measures to bring the Indian economy back on its feet. On the other hand, critics of Raghuram Rajan have expressed disappointment at RBI’s decision to increase the repo rate. These critics claim that repo rate will not affect inflation, but in turn affect exports and bring down the Indian economy. It is true that the hike in repo rate will reduce India’s export value; however, India cannot achieve all the goals through one policy alone. The pressing issue that India is facing at the moment is inflation, which is why all the monetary policies are aimed at addressing inflation. India’s manufacturing sector is hurt by the increasing repo rate saga, and manufacturing companies claim that inflation is rising because of inefficiencies in the supply chain. High interest rates and high inflation rate add to manufacturing costs and make the industry less competitive. In every step and decision, there is a trade-off. In the recent step undertaken by the RBI, there is a trade-off between inflation and export value. So, if inflation reduces, exports suffer and vice versa. Repo rate does help keep inflation in check even though some critics may think otherwise. RBI has always been changing the repo rate to keep inflation in check. In fact, former governor of RBI Duvvuri Subbarao increased the repo rate 13 times between March 2010 and October 2011. Repo rate is an instrument and financial tool that financial ministers and governors of central banks all over the world use to tackle inflation.